Large purple plums are SO plentiful here that we are having a hard time keeping up with them and there is no way we can eat them all fresh even though they are delicious. 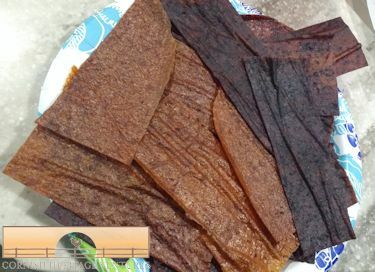 Dehydrating them in halves takes a LONG time so we decided to experiment with fruit leather. Yum! Yum! (Picture above actually shows both golden plum and purple plum leather.) It has turned out really well so here is our recipe. Be warned, we don’t add sugar so if you want a sweeter snack you will need to add some sweetener. Honey would probably be best but do your own experimentation. Line dehydrator shelves with parchment paper if you do not have the paraflex liners. Blend plums until smooth in a blender. Divide mixture between two trays and spread out with a spatula. Bang tray down on kitchen side to help even out. 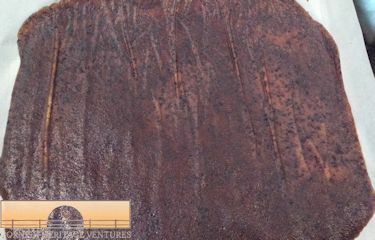 Dehydrate for 10-12 hours at 135F until firm but flexible. You don’t want any soft spots and the leather needs to peel off sheet relatively easily. Store between baking parchment and double bag, squeezing out air. Can also store tightly packed in jars. Label with date for future reference.